The other day I went down town Chicago for a job interview. Everybody knows how expensive is to drive and park in Chicago, so I took Metra. It has been five years since I took Metra, regularly, to down town Chicago, and I had quite an experience. Instead of reading, I decided to do some people watching, trying to see if anything changed from five years ago. On my trip down, the train wasn't very crowded and some riders took this as a permission to play their portable game units' sound volume to the max. Conversation on cell phones seems to have got louder, and people do not seem to bother anymore to hide their bad habits. Some of them down right disgusting. Seriously?! Isn't there anymore time at home to trim your nails? Or to clean your ears? Do I need to be subjected to that on my 45 minute Metra ride? Eew! After my interview, I had some time to kill before boarding my train for the ride back home. I start looking around Ogilvie Station and, to my surprise, I had a pleasant experience. Mostly due to my 20 minute browsing experience through the Bath and Body shop. Mmm! All those lotions and body washes, with all the new fragrances and packaging. Wow! Yeah! Alright, back to reality, Olivia! Anyway, that was blown away by what I experienced on ride back. I board the train thinking that one ride doing people watching is enough, so I pull out my book and start reading, looking forward to a quiet and peaceful ride home. No such luck! I barely finished a page when I was jarred from my quiet state by a yelling toddler that wanted the train to go "Awaaaaaay!" I am turning around toward the disgruntled tot to see if the mother is going to calm him down. To my surprise, I see that he is accompanied by his older brother, who is sitting quietly, and their nanny. The nanny is chatting away on the phone and doesn't seem to be bother by the screaming child. By now, people started to clear out from the car. The tot is screaming continuously, and the nanny continues to chat, unfazed, on the the cell phone. Needless to say, by now I am quite irritated and, refusing to leave the car, I turned around and told the kid that he can't yell like that, and the train will leave soon. A few minutes later, the nanny finally hangs up and tries to keep the child quiet. That until she starts chatting up a couple of girls that were sitting across the isle from her. Is it too much to ask to have a seemingly peaceful ride on the train? Was I like this nanny when my kids were young? I don't believe in not taking your small children out on trips on the train or in a restaurants. I do believe in making this trips an opportunity to teach your children what behavior is appropriate when you are in public. And, like that wasn't enough, while the train was approaching my station, I was in the vestibule and the guy in front of me proceeds to scratch his scalp, and pulling something out of his hair, and then, with the same hand, goes and cleans his teeth. Gag! I almost lost my dinner from the previous night. Seriously? This what we've become? Am I getting old and intolerant of other people, or people just got ruder? Is our society decaying to a level where we don't care anymore how we offend or hurt the person next to us? Isn't there any consideration for manners and public behavior? What are we really teaching our children? Beautiful day, today. I took the dogs out for a walk. Poor creatures! 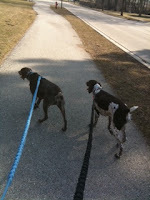 They didn't remember how it feels to walk on leash. Is their first outside walk this year. Their noses were up in the air or low on the ground, sniffing every little blade of grass. If you don't count the pulling, I had a rather enjoyable walk with my two four-legged friends. Shall I hope that Spring is here? I am afraid! This is Chicago after all. I remember a year, in the mid 1990s, when we had a snow storm on April 1. Yep! I got fooled. But, like Spring, hope springs eternal. It's time for me to finish any Fall/Winter knitting projects I have started, and dive whole heartily in Spring and Summer items. Stay tuned for pictures of new items. I have a store on etsy.com and every time I look at the "how to" emails, I see that everybody has a blog and they write about their store and things in their blog. So, this is my blog and my first, feeble attempt to compose a post. They say that you're supposed to write what you know. Well, that might be difficult for me, because I know a little about a lot. But, let's start with my little store on etsy.com. For lack of imagination I called it Olivia's Shop. Simple. It's my name after all. I loved making every item that is listed on my site, and a lot of people admire them. With all that, I still have only three sales since I opened it in July of 2010. Wait! I know what is wrong. My pictures. I don't have models and is hard for people to buy something that they can't touch or try on. I am getting better, though. I discovered a site, picnik.com, where you can upload your photos, fix them and then save them back on your computer. My latest listing looks a lot better than my previous ones. Besides, after much begging and cajoling, I convinced my daughter to model the hat. THAT was hard work!